communicate with each other more easily: one-on-one, but also in groups and as a planet. 1 However, I believe that the Python language comes closest to doing exactly that. See www.Python.org. something meaningful by attempting to teach the language. large steps in the right direction. try. However, I think the benefits are worth the risk. but only the prior editions. improvements and library features that were outside the purview of this text. code, which is downloadable from www.MindView.net. provides a basic foundation but also ventures into more advanced territory. 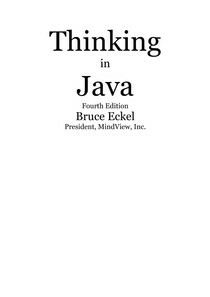 be best practices in Java coding (at least, within the limitations of an introductory text).